Atomic is a premium tough grippy opaque plastic that comes in a range of stiffness and with a variety of colours and effects. Magma plastic is a premium medium tough opaque plastic that has a very rubbery feel, the stiffer versions offer great grip and tend not to bounce off the targets as much as Atomic and Cosmic. There are a variety of colours and effects in this plastic. Strata is our base plastic which is opaque, tacky and medium to stiff. 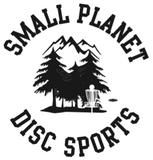 This comes in a range of colours, this is a good disc in the wet and breaks in nicely especially for those favorite putt and approach discs that you want to gently rock over.